Tópico em 'Técnica e Equipamentos' iniciado por Vince 20 Mai 2007 às 15:36. A propósito desta mensagem no seguimento... achei que se calhar era boa ideia um tópico com dicas para fotografar tempestates, raios ou mesmo apenas nuvens. Se tiverem dicas, partilhem também. Aqui ficam mais alguns registos conseguidos por volta das 00:15 um pouco depois da rotunda onde termina a Av. das Forças Armadas em Bragança. É relativamente fácil fotografar relâmpagos de noite como parece ter sido nesse caso, e a máquina tiver modo manual para exposição e a função Bulb e suportar um comando remoto. O modo Bulb serve para exposições prolongadas, deixando o obturador aberto o tempo que quisermos, ou até um determinado máximo nalgumas máquinas, 30 segundos por exemplo. This is very simple, even though many people at first don't understand how anyone can be so fast in triggering the shutter release after seeing lightning. The trick is, you don't do that, because you will photograph lightning during the night (indeed daytime lightning photography is quite a challenge). You make use of the B shutter speed mode, which will leave the camera shutter open as long as you want, and you wait for lightning to occur in the frame. The camera should be on a tripod, with a cable release: it should not move at all during the exposure, or the photo will be blurred. Lightning sometimes comes as a multiple flash with several channels. So, lightning photography is nothing more than setting up your equipment at night, setting focus to infinity, selecting the proper film speed and aperture, and open the shutter. 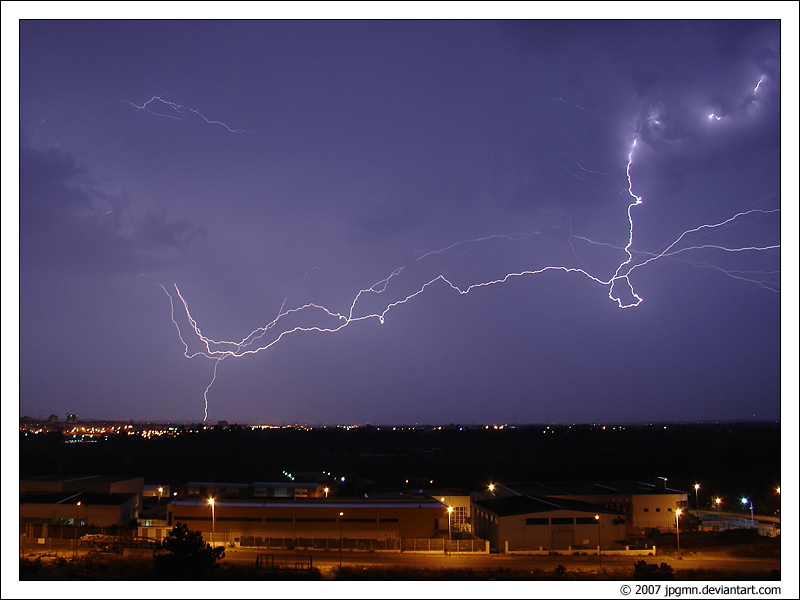 Then wait for lightning, and when lightning occurs within your camera's view, you close the shutter (by unlocking the cable release) and advance the film for the next frame. Complications arise, however, because you also have to deal with ambient light - light pollution, cloud movement and such - which will give your photos a look you may or may not want. The maximal exposure in cities is very limited, sometimes less than 30 seconds or so. If lightning is inactive, you'd spend a lot of film without lightning that way. Also, the correct exposure is still dependent on the film speed and aperture setting - it is the aperture setting which is one of the crucial factors determining the difference between good and mediocre photos. Another factor is composition. If lightning is very far away, say > 50 km, you will have to use a fast film, such as 400 ISO. Such lightning is in general not very spectacular to photograph, but you can practice anyway. If you have lenses which show coma at low apertures, you will have to use a faster film and higher aperture. Coma can really ruin a photo. Any coma of the lens (at lowest apertures) will readily show up if you photograph something as high-contrast as lightning. 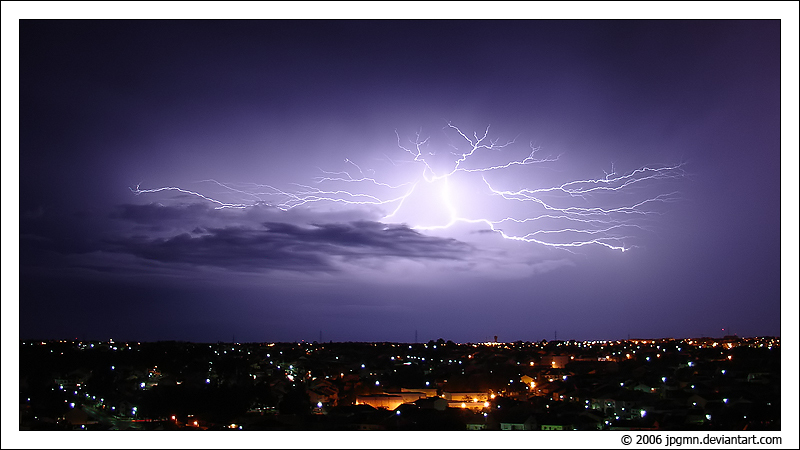 The lightning will be washed out and unsharp, while the foreground may still look properly focused. Exposure depends also on the power and type of the lightning discharges. Some lightning discharges may be close but not so bright; other (especially the very large bolt-from-the-blue) lightning will still be blinding at 10 km distance or so. The experience you have to develop is to guess the right aperture to within 1 stop or so, by looking at the brightness of the lightning. If there is a lot of haze or rainfall, the lightning light will be scattered, reducing the contrast of the lightning with the background. There is not much you can do to optimize this using aperture settings - except perhaps close the aperture more, but you will loose the branching of the lightning on the photo easily that way. One thing is very important to understand in lightning photography: you are essentially exposing two different subjects at the same time. Since you use B mode to capture the lightning, the foreground and background is continuously exposing your film, also when lightning is not happening. Your choice of film speed is fixed by resolution, and the aperture is fixed by the the brightness of the lightning. The exposure time is determined by the ambient light. Good lightning photos show properly exposed lightning as well as a properly exposed background/foreground. If lightning is close, the lightning will expose the foreground and you're done - but if not, you will have to stick also to a certain exposure time, disregarding the lightning flashes, in order to get the foreground exposed properly. This is usually very tricky. You obviously can't use B-mode; you will have to expose according to what the light meter of the camera says, minus one stop (minus two stops if you expect the lightning to be close). 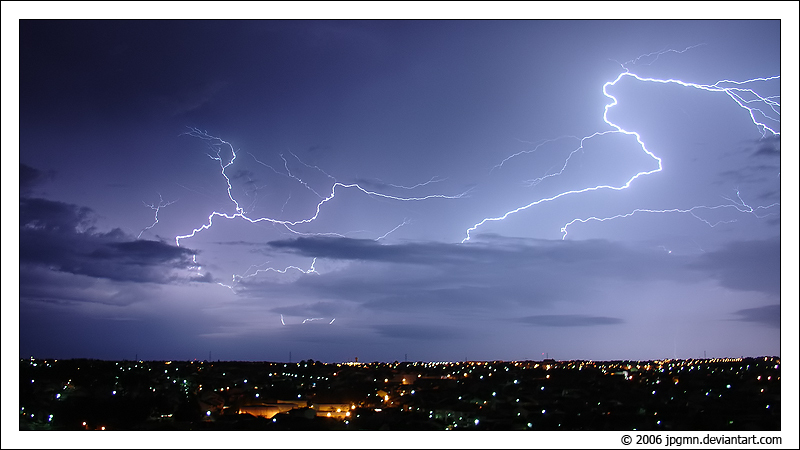 Use the same equipment and film as for nighttime lightning photography, and wait for a lightning discharge to occur within your camera's view. Then immediately react by pressing the shutter release. For this method to be successful, you should have a reaction time not over 0.2 second. If you have a longer reaction time, you have to train your reaction time with some game, if you want to do daytime photography. This only works if your camera is not too new - in other words, if the camera is mechanical and opens the shutter immediately after you press the release. You will have a fair chance to catch a subsequent stroke part of the same flash (if you notice the lightning flickering, you will usually have a short enough reaction time to photograph a discharge this way). Daytime lightning photography can be quite a challenge. However, you will in general not photograph any branches - because branches on CGs only happen during the first stepping-leader process and hence the first return stroke. Any subsequent leaders (dart-leaders) will follow only the main channel to ground, because this has a much shorter resistance to ground. So no subsequent strokes of a flash will show branches. If you are very lucky and very fast, you can still photograph the branches if you happen to react on a flash within the cloud, and while the camera is open, a CG occurs out of that flash, a fraction of a second later. If you expect such a thing to happen, you can close down the aperture and choose a longer exposure time - such as 1/2 second at f/22 or so (if the light level permits anyway). But keep in mind that with longer exposures during the day, you will reduce the contrast the lightning will have on the photo - because you expose over a longer time window the ambient daytime light, and the lightning would take just the same time to expose. Optimal exposure times are 1/15 to 1/30 second. For any much shorter than that, there's a fair chance that the shutter will open just in between two return strokes of a CG and thus miss the discharge (even though you would be reacting in time). Any much longer will cause a drop in contrast with the ambient light so much that the lightning may not turn out to be much discernible on the photo. Note: dusk and sunset allows for stunning lightning photos, because it is dark enough to have the shutter open for a few seconds, yet light enough to capture the daytime light on a time-exposure. Also, the colors of the sky at dusk can be very nice. Há equipamentos que para ligar à câmera que detectam uma descarga eléctrica tirando a fotografia, mas parece que também não é perfeito pois é sempre uma reacção a um raio que já está a acontecer. There exist lightning trigger circuits for your camera, both as a cheap, homebuild unit, and as commercial units. They react by sudden changes in light level. 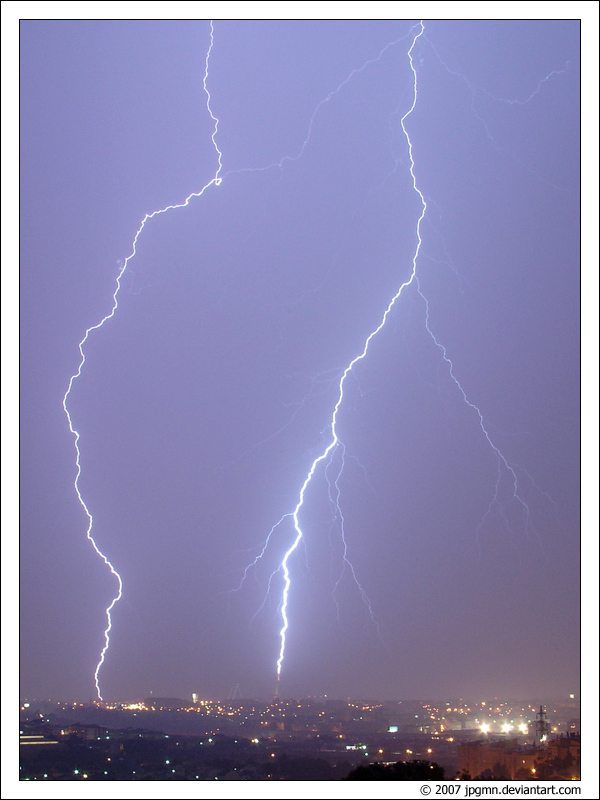 A trigger on your camera will catch most lightning, if it is multistroked - but again, no branches, since the trigger will generally be too late for those. Also, since it reacts to light changes, it will trigger even if lightning is not in your camera's view - and you may run out of film very fast. My experience is that personal reaction (at daytime) is more efficient in both saving film and success ratio than is a lightning trigger. At night, you won't need a trigger anyway. Re: Dicas para fotografar tempestades, raios e nuvens. Dicas do mestre do Extreme Instability, provavelmente um dos melhores fotógrafos de tempestades do mundo. Em relação ao método que usei para tirar as fotos passo a explicar e vão ver que não é preciso nenhuma máquina XPTO. Local: Janela de um 8º andar em Santa Marta do Pinhal, Corroios (para quem não sabe fica num alto, daí a vista desafogada que vai desde o Castelo de Palmela ao Palácio da Pena em Sintra). 1. Coloco a máquina no tripé e seguro-o com uma mão (ele não é assim muito estável). 2. Regulo as definições da máquina para algo do estilo: ISO 100 (o mais baixo que a máquina tiver), abertura F/2.8 - F/4.0 (depende do tempo de exposição que colocar), tempo de exposição entre 1,5seg e 5seg, foco no infinito. Normalmente será F/2.8 (ou o valor mais baixo que a máquina tiver) e 1,5 segundos. 3. Seguro a máquina/tripé com firmeza e pressiono o botão de disparo da máquina até meio (para reduzir o tempo de reacção da máquina ao disparar e evitar tremidelas no momento do disparo). 4. Quando cai um relâmpago pressiono o botão até ao fim e não largo até ao fim da exposição para não tremer a máquina. Este método dá para apanhar aqueles relâmpagos que se espalham pelo céu e que vêm atrás de outros. Aqueles que são isolados não dá para apanhar assim, são muito rápidos. Já experimentei usar um F/7.1 (mais um filtro ND4 para cortar ainda mais luz) e passar o tempo de exposição para 15 segundos ou mais mas não consegui grandes resultados... quando cai algum relâmpago nesse intervalo depois "desvanece-se" com a prolongada exposição e a foto fica muito clara. E para já é isto. EDIT: é verdade, esqueci-me de mencionar. As fotos depois levam um pós processamento para retirar um pouco do ruído que por vezes surge e um redimensionamento. Como o assunto voltou à baila nestes dias, sobre a grande dificuldade de fotografar raios de dia, encontrei este esquema para um lightning trigger baseado no Arduino. Visto que no tópico da Auriol agora temos uns especialistas do Arduino, talvez eles possam dar uma olhadela nisto para ver quanto trabalho e custo isto envolve. De facto, é um tema que me tem apaixonado vai para muito tempo. Depois de ler aqui e ali, colher algumas dicas, por vezes as coisas não correm como eu gostaria. Bem, na próxima oportunidade vou colocar-me em local abrigado, colocar a minha Canon 500D num tripé não muito resistente, cabo disparador, máquina no modo manual, na posição Bulb e esperar que apareça um raio. Quel tal fazer exposições de 15 ou 30 segundos com filtro polarizador, será que vai resultar??? Tenho uma Canon EOS 1100D mas não consigo fotografar raios. A abertura dlente e a função bulb estão activas, mas sempre que tento mesmo não tremendo a foto fica toda branca :S. eu Sou um leigo nesta matéria ainda, mesmo demasiado. Alguem pode dar me umas "luzes?" Está a entrar luz a mais, que settings estás a usar? se for de dia dificilmente vais passar de 1/8... também numa APS-C não se deve fechar a lente muito além de f16 porque degrada a qualidade da imagem. Não uses bulb, a não ser que queiras exposições > de 30 segundos, e de dia isso não acontece sem filtro ND. Já agora, vou instalar o magic lantern na minha 550d e experimentar fotografar raios com o modo de detecção de movimento. E estás a fazer exposições de quanto tempo? 1/8 é ao tempo de exposição(realmente não disse a que me referia), geralmente espressa em avos de segundo. Filtro ND é um filtro escuro que enroscas na lente que "rouba" luz para poderes aumentar o tempo de exposição, tal como a conduzir com o sol de frente dá jeito uns óculos de sol.